The compact Ford Escape SUV is still a popular choice for all who desire a more capable, spacious vehicle. Potential new owners will delight in the latest interior offerings. See what comes with the Escape by visiting our new Ford inventory. Choose a model with a panoramic sunroof to enhance the view along the way. The expanded design provides front and rear seat occupants with great views. The option adds more light to the cab and opens to allow the fresh air inside. 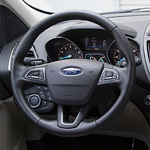 The ergonomically designed steering wheel fits the hands of any sized driver with ease. The heating feature keeps your hands warm on the coldest of days. Drivers also have the convenience of controlling the infotainment system and cruise control thanks to the incorporated buttons. The Escape also comes with a complimentary five-year Sirius traffic and travel link subscription. Learn more about the available packages that Ford offer on the new Escape models at Ford of West Covina.